So, on Sunday night I got a text from upstairs to ask if they could use our wi-fi, as theirs had gone down, and Kate was trying to send an urgent job application in. 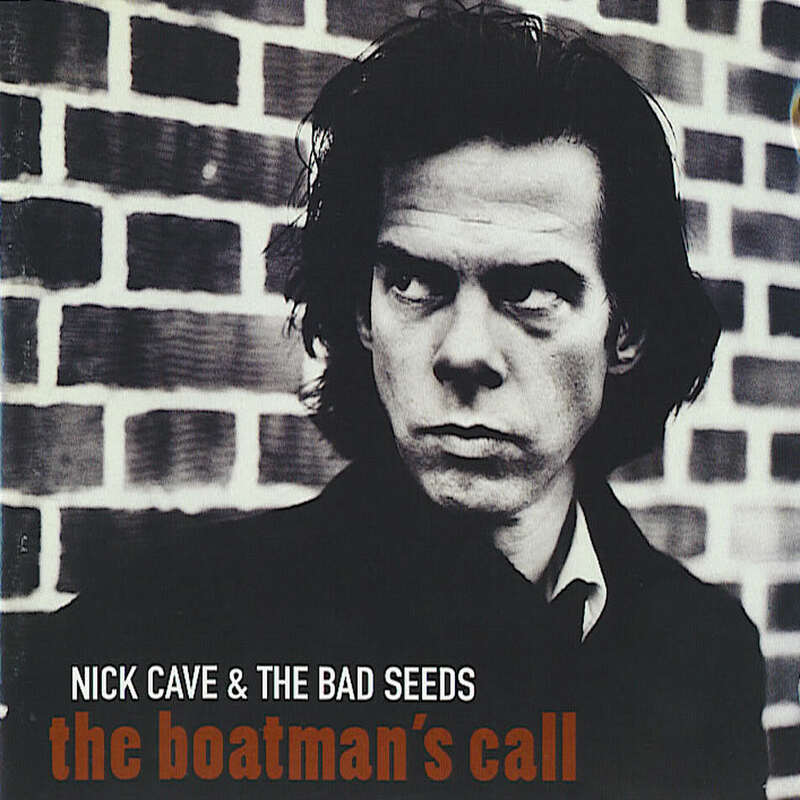 I texted back to say 'sure'; they texted to check that our network was the one named Nick Cave, which... ah, well, yes, it is. Only because when the computer asked for a name it was the first one that came to mind. But that was ok, upstairs revealed that Andrew is a huge Cave fan too, and all was well. 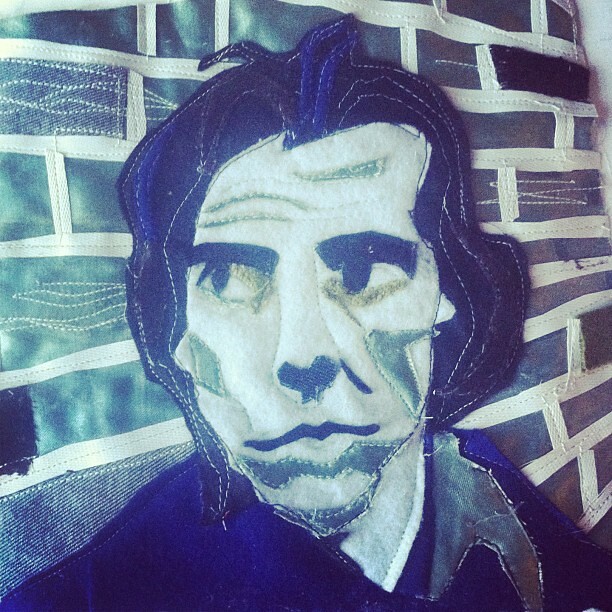 What I didn't reveal was that, between texts, I was assembling a fabric appliqued picture of the man himself. Because that would have seemed weird. Last week, I failed to buy tickets for the London dates of this tour, because, although I was right there when they went live, it turned out they were £50 each, there were none left close to the stage, and you had to buy a minimum of two. By the time I'd thought it through, they'd all gone anyway, and the decision was made for me. So here was my chance! The challenge was to recreate a Cave/Grinderman/Bad Seeds album cover in whatever format you liked - plasticine, cake, paints, whatever. But it had to be in by Tuesday night. In a hurry, Item, The Boy and I all looked at my record collection. I have to say that, in the main, they are a spectacularly uninspiring bunch of covers for this sort of thing. Item got her toys out and went part way towards a good stab at The Good Son.. but... I didn't feel it was going to win us the tickets. In the end, I recreated one of my favourite Cave albums, The Boatman's Call, sewing it out of small scraps of fabric we had around the house - some of it fabric I've actually owned since the days when I first became aware of Cave's work, as it happens. It took an evening and a half; I pretty much screwed up the lettering through hurrying it, and then it was really hard to take a photo that did it justice. Whoop! There's incredibly tight security around it all. They wouldn't tell us the venue until I'd gone to pick up the tickets, and I had to show photo ID and then they wrote my name on them in big letters so that I couldn't sell them on - I'll also have to show ID at he door. Oddly enough, the venue is our local swimming pool and gym - apparently it's where Nick always rehearses. *Buys annual pass for pool* The record shop did not laugh when I asked if it was in the soft play area. I have to say that, apart from being so delighted and excited about going to the gig tomorrow, the atmosphere on Twitter has been really fun, with lots of Brightonians all buzzing about the contest and talking about or showing their entries, with varying degrees of paranoia about whether people would copy them. It's felt a lot like the beginning of Charlie and the Chocolate Factory, when there are still golden tickets to be found. And I've won one - hooray! There are other winners here and here and here. They're all fab, and all totally different. what a great competition. * An album which I have to say is leaving me slightly uneasy with its cover art and video content's implied misogyny, but let's gloss over that just for now, at least until I've consumed it properly.